On Friday the 9th June, the AFR ran an excellent article on the new breed of superannuation funds hitting the Australian market place, most of whom are targeted towards Gen-Y and millennials, Australia’s most populous generation. “Inside the multi-billion dollar battle for Millennials’ super”, which you can access here, looked at three recent entrants to the market, Spaceship, Grow Super, and Zuper. 1). "These products are heavily marketed to the young and gullible. They appear to offer something innovative but the promoters appear to have no experience in investment management”. Though we do seem to have a shared love of the Betoota Advocate, I have no relationship with any of these new entrants. Despite that, this article will dissect and attempt to rebut the critiques above. The first comment regarding the gullibility of young Australians is almost deliberately offensive, especially given the myriad critiques levelled at the superannuation industry itself, which is now feasting on over AUD $30bn in fees per year. Worse than that though, the comment about the supposed lack of experience in investment management is at worst wrong, or flat out misleading. As the article points out, the actual investment decisions for Grow Super will be made by Dimensional Fund Advisors, who manage close to $650 billion. Meanwhile, the Spaceship product is a high growth superannuation fund. It does have a specific tilt towards technology stocks, but its overall asset allocation is in line with standard growth funds. Yes it will likely underperform if the FANGs of this world lag broader equity indices in the coming years, though, provided it doesn’t hedge its currency risk, it may well pick up some performance if the Aussie dollar falls in the coming years. Indeed a potential performance kick on the currency may, on a relative basis, help them outperform growth fund peers, even in the face of a broader equity market correction. Remember too these funds are being overseen by APRA. They have to play by the same rules as everyone else – RE’s, Custodians, AFSLs, you name it. They are not being set up by cowboys operating in an unregulated market, and allowing young Australian’s to punt all their super on whoever is promising to build the next whizz bang app. A final point I’d make here is regarding the track record of the incumbents, who Rice Warner appear to be defending. According to Chant West, the median Australian growth fund (which is the type of fund most Australian’s default into) returned just 5.2% in the 10 years to December 2016. That is barely better than cash, and worse than most property markets. Given the volatility along the way, most Australian’s would have been better off putting their money in a term deposit, or paying down their mortgage, rather than paying billions in fees every year to those who are very “experienced” in investment management. Indeed one could argue these newer entrants to the superannuation space have some advantages over their larger competitors too. The first is that they are small and nimble, with relatively little in the way of FUM. That will make it much easier for them to respond to the challenges financial markets will provide in the coming years. They also have the benefit that every single one of their clients has made/will make an active choice to become a member of their funds. They are going out to win the business from the incumbents, actually engaging would be clients in their superannuation. This is a far cry from many incumbents in the industry, who for two decades plus have relied on the fact most Australians are unengaged with superannuation, and tend to stick with whatever fund they were first thrown into, or whichever one their employer has chosen for them. As I discussed in an article earlier this year titled Exter’s Pyramid and the End of Easy Money, investment returns are going to be hard to come by full stop in the coming decade. The new entrants have as good a chance as any of delivering on that score. I’m not going to argue that fees are not important, for they most certainly are, and the desire to control them was one of the key reasons I set up a SMSF a few years back. But this obsession with fees, and almost sole focus on cost alone that we are seeing across the industry has arguably gone too far already. Regarding the new entrants to the market – all are being very open about the fact that they are not the cheapest players in the superannuation space, as well as the fact that their fees will reduce over time, as they scale in size. The Grattan Institute regularly comment on the outrageous level of fees across the broader Australian superannuation space, that to this day run at nearly three times the OECD median. 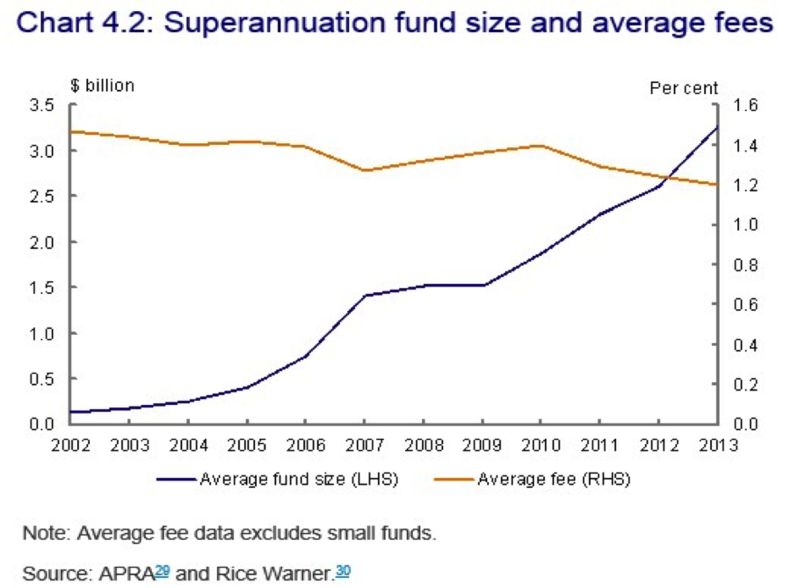 And as you can see from the chart below (somewhat ironically, it looks like Rice Warner had a hand in producing it), which was included in the draft report on the Financial System Inquiry, the explosion in FUM over the past 15 years has not been matched by a meaningful decline in fees. As we discussed earlier, returns have barely beaten cash in the last decade, so it’s difficult for incumbents to argue that the healthy, and growing fee’s they've been charging all this time have benefitted their clients/members much in that space. Given the numbers quoted in the paragraph above, I think the personal anecdote below is broadly representative of the user experience Australians are getting from their Superannuation funds today. Recently, my partner and I decided to roll her superannuation into what was up until now just my SMSF. Before doing so though, we had a bit of a look at where her money was currently invested. The image below is quite literally a screen grab from the online portal of her superannuation provider. 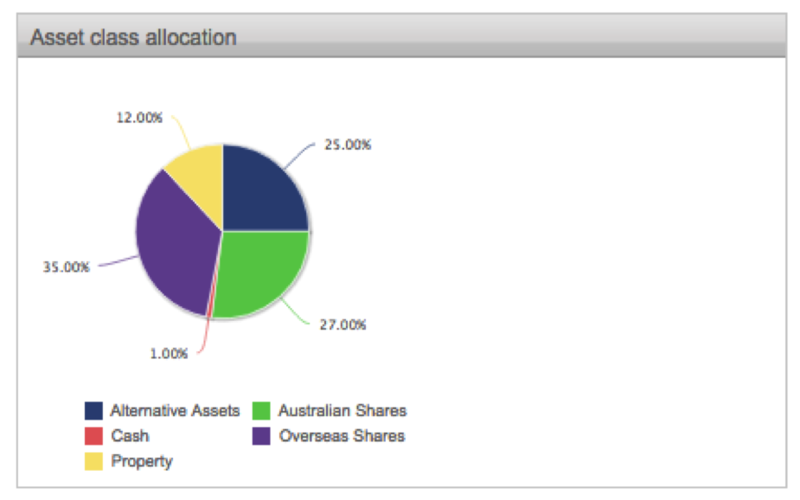 A pie chart for asset allocation that looks like it was made using a late 1990s version of Microsoft Excel. Compare that to Spaceship, which can break down how $100,000 is invested into each of the major companies, telling me that I would have $2,845 of that $100k in Apple for example. That might not be what I want, but at least I know where on earth the cash would be going, whilst Spaceship can also quite rightly argue that they’re offering a unique investment solution with their product. Before moving over to a SMSF, we also looked at updating her insurance, thinking we might keep the industry fund open just for that purpose. What a headache, for despite the fact the Superfund has all of her personal details on file, the insurance form one needs to print off and manually fill in is some nine pages long. Pretty much the very first things it asks you to fill in your name, address, date of birth, email etc. – despite the fact the superfund clearly already knows all this information. Compare that to Grow Super – where it can pretty much all be done online, with a basic opt-in/opt-out function. Quite what this enhanced user experience is worth is of course subjective, and impossible to quantify in basis points alone, but I think we can all agree there is some value in the approach taken by the new entrants into the marketplace. Finally, when it comes to the incumbents, before requesting a rollover, I asked my partner how long it had been since she had heard from her superfund, as in receiving a phone call. The answer was never. But knock me down with a feather, the minute she said was taking her money away, the friendly people there offered her “access to financial planning advice”. Better yet, the first meeting was free. They were also polite enough to send us a superannuation “Fact Sheet”, which is a thinly disguised warning about the supposed perils of having a SMSF. Despite the fact it’s now June 2017, the document they sent, and the material they reference, was published in 2014. Finally, they let us know that it would take at least 5 days to process a rollover, and that it would only be processed if we provided certified ID, and filled in a six page redemption form. Curiously, there was no requirement for certified ID to be provided when the account was opened. Bottom line: Cheaper is not necessarily better. As such, whilst those from the big end of town are likely to be cheaper than some of the new entrants today, they may still wish to think twice before making too much noise about the cost issue. There is a saying about people in glass houses after all, and we see no reason why the Spaceships, the Grow Supers and the Zupers of this world won’t be able to compete on cost alone in due course, as well as quality, user experience, customer service, and most importantly, net returns. We don’t need greater control? The comment that we don’t need greater control when it comes to our superannuation was a genuine laugh out loud moment. It is so obviously wrong. 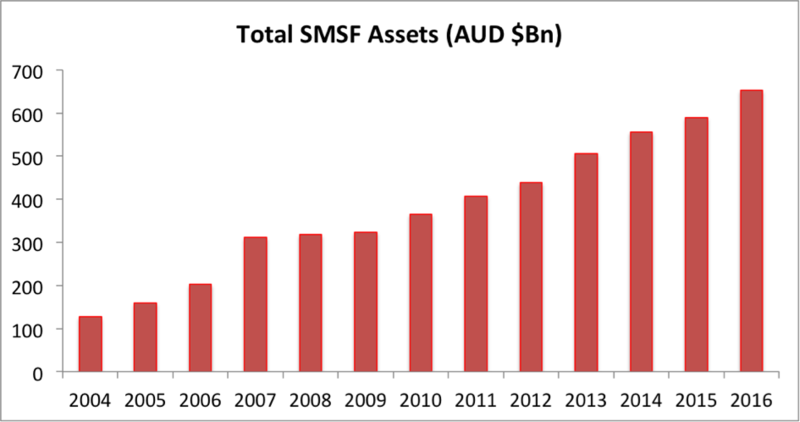 To demonstrate that point, we need not look at millennials, but rather at the explosion in the number of Australians choosing to self-manage their superannuation, and the total funds they now control, with the FUM sitting in SMSF’s, and how this has grown over the past ten plus years seen in the chart below. Survey after survey of SMSF trustees places the desire for more control over their money as either the number one reason why they set up a SMSF in the first place, or very close to the top of the list. Transparency, and knowing exactly what they are paying for tends to rank pretty highly too. This exodus to SMSF over the last 10 years should have made it abundantly clear that a sub-standard user experience, lack of transparency re fees, poor net returns and largely indistinguishable service offerings are not the best way to maintain your client base. That lesson is going to be doubly true for millennials who are digital natives to start with (they hate paper forms), sceptical if not outright distrustful of the financial services industry (can we really blame them given the world they’ve grown up in), and socially conscious to boot. Considering superannuation will take at least 9.5% of their incomes for every year they are in a job (i.e. it wasn’t phased in half-way through their working lives like it was for most of todays retirees), it will in all likelihood be the largest financial asset most millennials build across their working life, and by some margin. Good luck telling them they don’t need, or shouldn't want control over where this money is invested. Whether or not the new entrants to the superannuation space end up being successful as operating businesses, and whether or not the net return they deliver to their members ends up being superior to whichever funds their clients’ choose to rollover from remains to be seen. But as a pushing age 40 financial commentator who has long argued that the superannuation industry as its currently structured is too big for Australia’s own good, we think its great to see young entrepreneurs step into this sector, and we wish them the very best of luck. Great article, great assessment. Curious as to what SMSF tools you use?